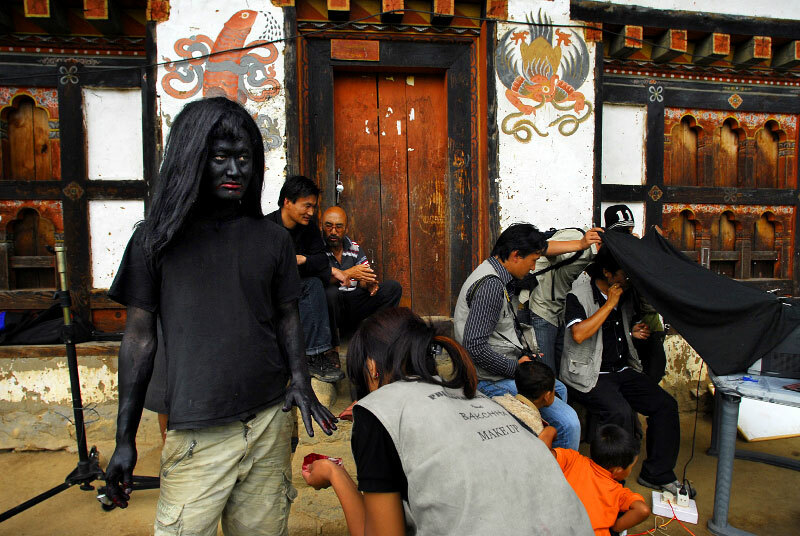 A Bhutanese actor painted as a demon stands next to the director on the set of Bachha, a drama and love story with Bolliwood-style dance sequences, directed by Tshering Wangyel, in Punakha, western Bhutan, August 5, 2007. Though Bhutanese cinematographers made their first film as late as 1989, roughly 25 films were made in 2006, alone. As Bhutan tries to cater to its own citizens and shy away from being totally dependent on Indian cinema, its film industry is thriving. Equipment is incredibly basic, and must all be imported from India, and actors and actresses are often forced to prepare their own make-up, but the Bhutanese audience is receptive to local cinema.